A sophisticated vegetarian cookbook with everything you need to feel at home in the kitchen, cooking in the most nourishing and delicious ways. 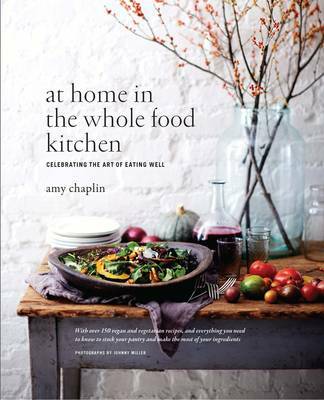 With her love of whole food and expertise as a chef, Amy Chaplin has written a book to entice everyone to eat well every meal, every day. She provides all the know-how for creating delicious, healthy dishes based on unprocessed, unrefined food - from the basics of good eating to preparing seasonal feasts all year round. Part One lays the foundation: how best to stock your cupboard. Not simply a list of ingredients and equipment, it provides real working knowledge of how and why to use ingredients, plus an arsenal of simple recipes for daily nourishment. Part two is a collection of recipes celebrating vegetarian cooking in its brightest, whole, most delectable form, with such vibrant dishes as black rice breakfast pudding with coconut and banana; fragrant aubergine curry with cardamom basmati rice, apricot chutney and lime raita; and honey vanilla bean ice cream with roasted plums and coconut crunch. Inspirational, healthy, sustainable and delicious - this is whole food cooking for everyone.